Chimpanzees patrol in groups for the same reason wolves hunt in packs, because what they can achieve working together far exceeds the returns of more individualized efforts. Patrols are conspicuous events that occur when multiple individuals, typically male, travel to the peripheries of their territory and sometimes deep into those of their neighbors. During these incursions, patrollers become hypervigilant and behave in other ways that suggest they are actively searching for neighbors. If the patrolling males find members of a rival group, they will attack and sometimes even kill them. Unlike other animals, who will fight when groups happen to meet at the edges of their territories, male chimpanzees seem to deliberately search for neighbors while on patrols, potentially putting themselves in harm's way for uncertain gains. So why do male chimpanzees choose to patrol when such forays may lead to violent, even lethal, encounters with members of neighboring groups? Patrols may benefit everyone by increasing the size of the territory and the food supply, but individuals also have the option to shirk patrol duty since unhelpful members are not punished or ostracized. To determine how male chimpanzees manage to achieve and maintain this remarkable form of cooperation, researchers—led by Kevin Langergraber of Arizona State University's School of Human Evolution and Social Change and Institute of Human Origins—examined twenty years of data on who participated in patrols in a 200-member-strong Ngogo community of chimpanzees within Kibale National Park, Uganda. The results of this study are published in the Proceedings of the National Academy of Sciences. By combining analyses of patrol participation with results of paternity testing on 122 group offspring, Langergraber and colleagues found that, over the long run, patrolling paid off because it increased group size, which is important in determining success in competition against other groups. "The Ngogo chimpanzees patrol and kill neighbors more frequently than any other chimpanzee group," says John Mitani of the University of Michigan, who has studied these particular primates for 22 years. By 2009, the group expanded the size of their territory by 22 percent over the previous decade after killing 13 individuals from a neighboring group. Because of their success in competition against other groups, the Ngogo chimpanzees benefit from an unusually good food supply and long life expectancies. But patrolling is a potentially dangerous as well as energy-sapping activity, and time spent patrolling is time that cannot be spent eating or mating with females in the safety of the territory. The study showed that males varied in how often they patrolled, and it was no surprise that high-ranking individuals, who were likely to be in good physical condition, participated frequently. In addition, males who had more offspring living in the group, and thus more to gain by territorial expansion, patrolled often. However, not all patrolling events could be explained by such short-term benefits, as many males patrolled when they had no offspring or other relatives living in the group to protect. Why should males pay the costs of patrolling to benefit the relatives of other individuals? In this large group, reproduction was not monopolized by a few high-ranking males. Males who patrolled when they had no offspring were thus very likely to reproduce in the future. So even if a male has nothing to gain by protecting relatives now, by patrolling and thereby protecting and increasing the size of the group, he can gain in the long run. "We know that humans have means ranging from gossip to drastic punishment to aid cooperation in group settings," Langergraber says. "The puzzle has been to explain cooperation in animal societies, where shirking would seem an attractive option." 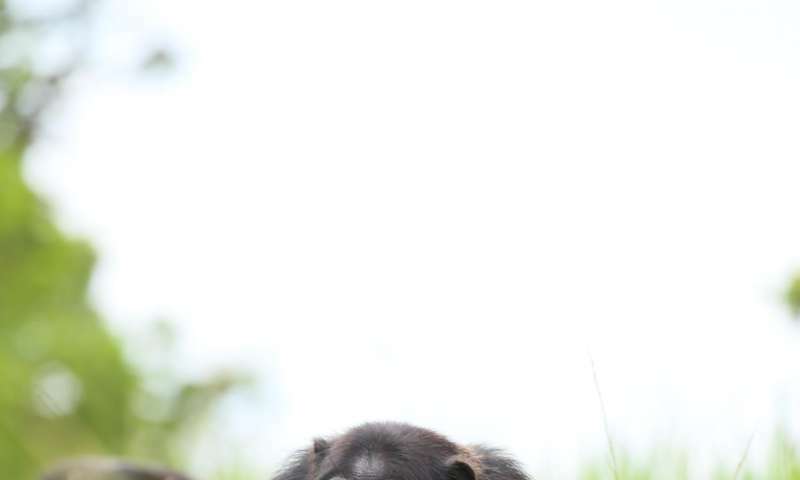 Most studies have focused on short term benefits of cooperation, he adds, "but our study shows the benefit of long-term data collection, and also that we still have a lot to learn from these chimpanzees." Yea, WAR! That is what brings a species to the top of the food chain. War sharpens their skills and advances their evolution. Please don't misunderstand me. Now that we can almost shape our own evolution using gene editing, war is not necessary for advancement anymore.